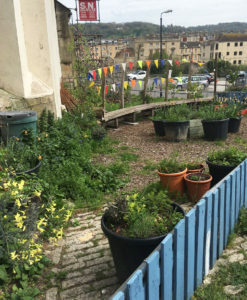 A few things have changed down Walcot Street in Bath since Jane Austen went shopping for decorative fruit and flowers in June 1799. She was looking for a present for her sister Cassandra – fashionable items (and expensive so it seemed) to decorate her bonnets. Jane didn’t have much luck as she reported to her sister a week or so later. I wasn’t looking for decorative fruit or flowers or anything to buy. It was the spring weather which had drawn me to Bath on a Sunday afternoon – to see the tulips in bloom in Victoria Park, pay my respects to the Royal Crescent and have a stroll round town. It’s a while since I had a proper walk along Walcot Street and I was interested to see what was familiar and what had changed. St Swithin’s Church, Walcot was built between 1777 and 1790. It’s a long street, running parallel to the River Avon on the right and Broad Street running into The Paragon – on your left going out of town. 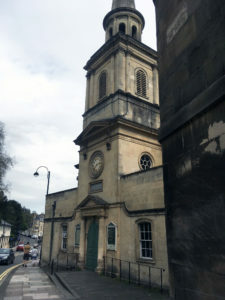 It starts with St Michael’s Church (very nice tea room and loos) on the corner of Broad and Walcot Streets, and ends with St Swithin’s Church on the corner of The Paragon. This is the church that Jane’s parents were married in and where the Rev George Austen (Jane’s father) is now buried, next to Fanny Burney, one of Jane’s favourite authors. Many of the shops in the city centre were open but most were closed the further you went away from the main drag. Walcot has lost a few shops and restaurants since I last visited, and gained other businesses. 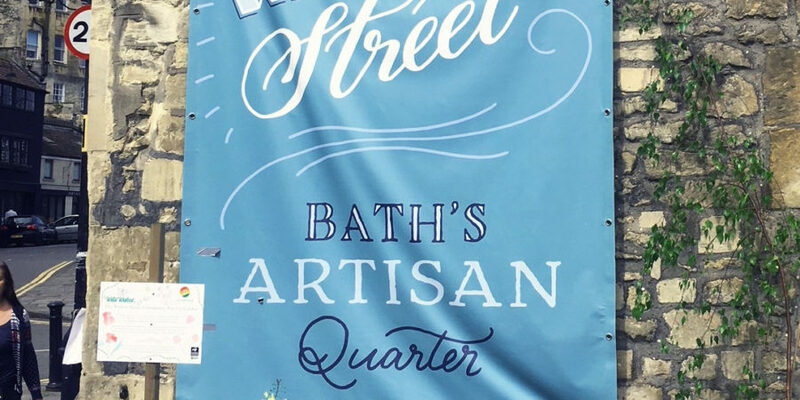 It’s gone a bit more upmarket, calling itself ‘Walcot Street, Bath’s Artisan Quarter’. A pop-up street garden welcomes you, still in its early stages from the look of it but at least it distracts you from the car park where the flea market meets on Saturdays. 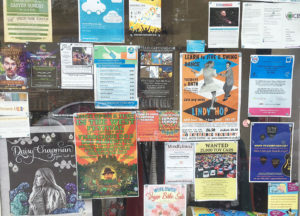 Charity shops are still prominent with The Bath Women’s’ Refuge and Julian House but a new Dorothy House Bookshop has opened- double fronted and full of goodies. Certainly a rival to Oxfam, with a wide range of books well displayed from a Margaret Atwood first signed edition to early Chatterbox annuals and everything in between. 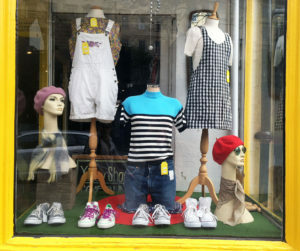 Plus a large area at the back selling vinyl records. There is even a dansette player in a cubbyhole to listen to tracks before purchasing. Bath has lost most of its antiquarian bookshops and I’m pleased that the charity bookshops have stepped into fill the gap to some extent. You can still browse and touch real books rather than clicking onto an online page and looking at a stock image. And the joy of serendipity. You never know what you’re going to find on the shelves. Computer repairs, cupcakes and coffee, vintage clothes, American comics, Thai cuisine, posh wool, bikes, sewing machines and posh paint are all to be found. But no artificial fruit or flowers.